Swarming is the process by which a new honey bee colony is formed when the queen bee leaves the colony with a large group of worker bees. In the prime swarm, about 60% of the worker bees leave the original hive location with the old queen. This swarm can contain thousands to tens of thousands of bees. Swarming is mainly a spring phenomenon, usually within a two- or three-week period depending on the locale, but occasional swarms can happen throughout the producing season. Secondary afterswarms may happen but are rare. Swarming is honey bee colonies’ natural means of reproduction. In the process of swarming the original single colony reproduces to two and sometimes more colonies. Do you need help with a swarm? In the past the collection of a honey bee swarm would be co-ordinated via the OBKA’s Swarms Liaison Officer whom you would initially contact. However there is a new process in place managed by the British Beekeepers Association (BBKA). All swarm collectors have made their location and contact details available that are displayed on a map. By putting in your location you can see the details of swarm collectors local to you and contact them directly. Access to the map is below. However before you consider contacting a local swarm collector please read the ‘Is the swarm honey bees?’ section below carefully and try and identify whether the swarm you have are honey bees as swarm collectors are unable to help remove any other insects such as solitary (bumble) bees and wasps. Is a swarm of bees dangerous? A swarm of bees can appear very alarming, however if you exercise a little caution they are normally of no danger to humans or animals. Can someone come and collect the swarm? Please note that no guarantee can be given that someone will be available to attend or that the beekeeper will collect the swarm. The final decision as to whether a swarm is safe or viable to collect lies solely with the attending beekeeper. We only collect honeybees and under no circumstances will we destroy honeybees or any other types of bee/insect. Is there a charge for the collection of my swarm? 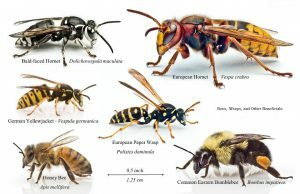 What can I do if the bees/insects I have cannot be collected and they need to be removed? If the bees/insects you have cannot be collected by a local beekeeper, you can contact the Environmental Health Department of your local district council. Whilst councils don’t consider bees (whether honey or not) as pests they do provide control services, that do vary between councils, should your ‘visitors’ turn out to be pests. To determine if the swarm that you need help removing is honey bees please follow this identification check-list on the British Beekeepers Association website. At the end of the identification check-list is the map of swarm collectors. Enter in your postcode and you will see details of swarm collectors nearest to you.